When I work on nutrition with my patients I find that many people are in need of more nutrient dense foods in their day. Increasing the fiber through plant foods is the best way to do this. When we put the words “fiber” and “plant food” together the thought that may come to mind is “boring.” But I’m here to show you that’s not the case. 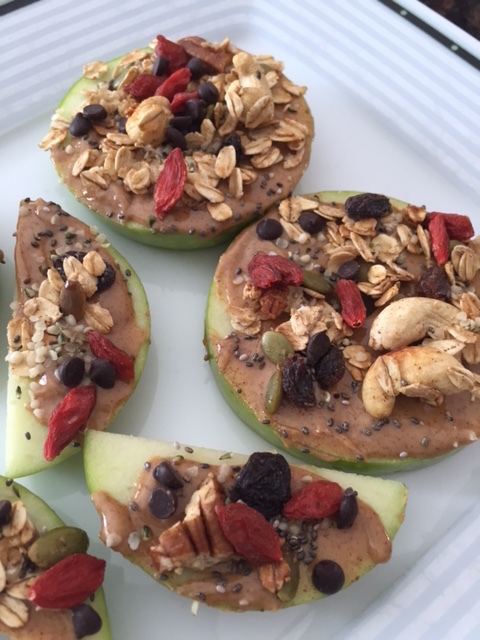 Here’s one of my favourite snack recipes and it will knock your socks off! It fits my criteria of easy, tasty and healthy. All plant food here, people… and you’re going to love it. Assembly: Cut apples. Top with almond butter. Sprinkle with fun toppings*. *Fun toppings can be anything you want to add. If you don’t have granola raw oats. Try shredded coconut, chopped dates, sesame seeds, sunflower seeds, dried cranberries… etc.